A Guide To Wine Cork Crafts! Perhaps the most popular of wine cork crafts is the wine cork message board. This craft was popularized by Martha Stewart a few years ago on her television show. All you have to do is cut each cork in half length lengthwise, glue them together and voila, you have a message center. The Martha Stewart version of this wine cork craft involves buying a large frame and foamcore backing cut to fit inside the frame. The whole corks are glued to the foam core and placed very tightly next to each other and a few wine labels are decoupaged to decorate the wooden frame. Before you know it you will have created an elegant message center. Individual wine corks can also be glued to fridge magnets to make a mini-message holder that sticks to the refrigerator. Lately, wine cork wreaths are popular among those creating wine cork crafts. You can string the corks together with needle and thread and then bundle the corks into a wreath or you can glue them to a circular Styrofoam armature. Wine cork wreathes can also be constructed by using straightened paper clips to hold them together. The paper clip links to each cork can be concealed with tiny ribbons and bows. If you collect the wine corks after an anniversary or wedding party, a wreathe can me made to present to the happy couple as a memento of the special occasion. Wine cork crafts can also involve the creation of stamps. This involves carving a letter or shape into the bottom of a wine cork to create a personalized stamp that can be dipped into paint. Apparently these type of cork crafts work best with paint than ink as cork does not absorb ink very well. Industrious wine cork craft enthusiasts have used corks to create kitchen trivets or even large tables. Large pottery vessels can more securely support a glass table if you slice wine cork into quarter inch thick coins and hot glue them to the vase first. This means that the glass top you set on your home made table won't shift around. Wine cork crafts are also used for decorations. An attractive hanging room divider can be made by drilling a hole down the center of the corks and then stringing them end to end to make a hanging bead curtain. The look is especially enhanced if you put a pony bead or a similar type of decorative glass beed between each cork segment. This kind of hanging bead curtain not only has the effect of a wooden screen but it is also lightweight and water proof. Fishermen and women might be attracted to cork crafts because corks make great fishing bobbers. You will need to drill a hole through the bobber first. Then have a piece of dowling or reed that extends about 11/2 " at the top and bottom of the cord. Make a notch in the dowling to secure the fishing line. As soon as you get that first nibble on your line the bobber will tip. Most tropical orchids live on tree branches. Wine cork is the bark of the Mediterranean oak tree (Quercus suber) and decays very slowly. Many of orchid grower use crumbled wine corks to grow plants. Apparently just a one wine cork can feed an orchid for up to two years! 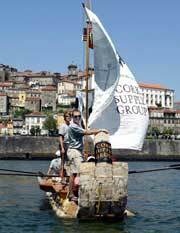 Perhaps the best of the wine cork crafts was the two ton 17-foot craft constructed from 165,32 corks that was built by John Pollack and Garth Goldstein and sailed for a 17 day journey down the Douro River in Portugal in 2002. Arts And Crafts Secrets is a FREE newsletter that contains all kinds of FREE arts and crafts tips, ideas, and money-saving suggestions. New! Cork Crafts For Adults.